When prehistoric humans first discovered fire, their lives were catapulted to a whole new level of sophistication. From the numerous applications of fire that humans managed to discover, the one that most notably revolutionized their existence was cooking, i.e., using fire to heat, fry, boil and roast the food they had previously consumed raw. Since then, there have been many more inventions that have further improved the practice of cooking. In the last century, however, two tools for cooking food have garnered a great deal of popularity and fanfare – microwave ovens and induction cooktops. While we have discussed the working principle of microwave ovens in the past, it’s time to turn our attention to induction cooktops. 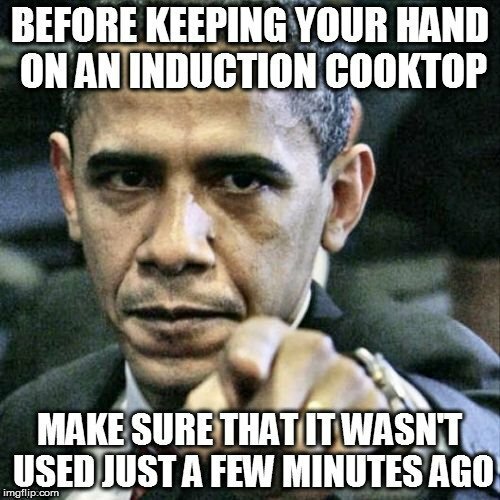 However, before understanding how they really work, it’s necessary to understand what induction really is. Electromagnetic induction, which is often referred to simply as induction, signifies the production of an electric current across an electric conductor, caused by a changing magnetic field. You see, electricity and magnetism are not two disjointed things; they are two entities originating from the same underlying phenomenon – electromagnetism. Due to this, a change in a magnetic field leads to the generation of electric current; similarly, a change in the electric field across a conductor produces a magnetic field. The latter is the working principle behind induction cooktops, which is pretty much all you need to know to understand the working of induction cooktops. 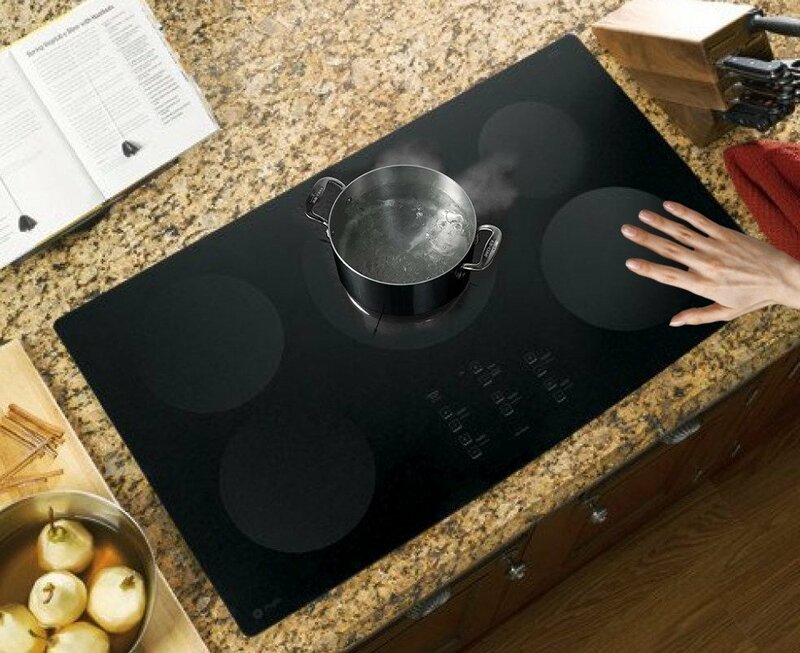 An induction cooktop looks like any other ceramic cooktop, with different zones for placing pans and pots of varying sizes. It consists of a tough, heat-resistant glass-ceramic plate on which the user places pots and pans that need to be heated. Directly underneath the plate there is an electromagnetic coil of metal that is electronically controlled. This is the main component responsible for heating the vessels kept above the cooktop. 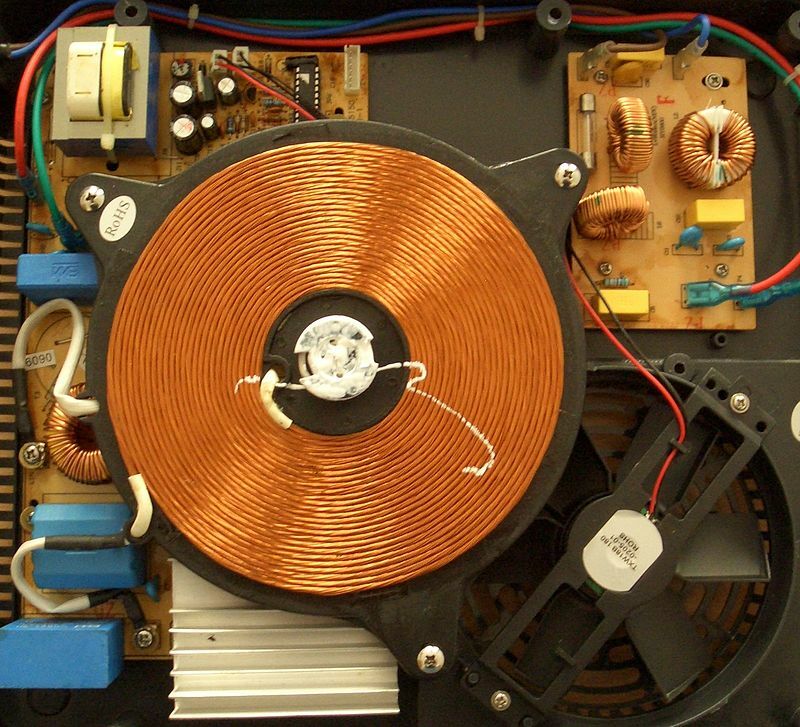 When you switch on the power supply of the cooktop, an electric current passes through the coil. The electric current passing through the coil produces a magnetic field in all directions around the coil, including directly above it (where pots and pans are placed). Note that until this point, no heat is generated, as the magnetic field being produced doesn’t produce any heat unless a third object – the cooking pan – is introduced into the mix. 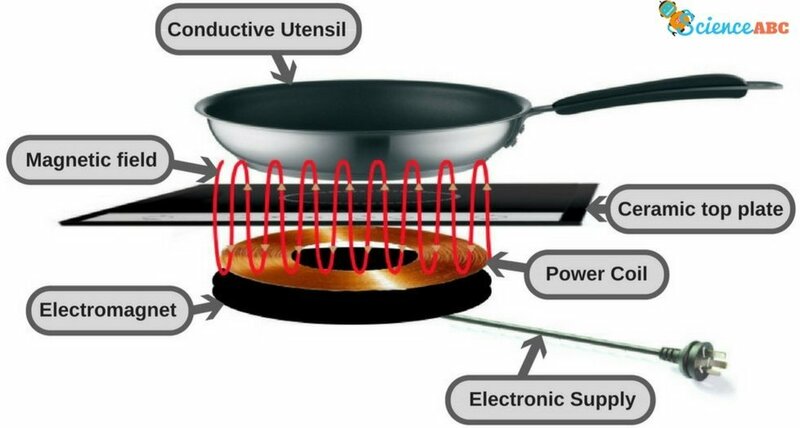 When a cooking pan (made of a suitable material) is placed on the cooktop, the magnetic field produced by the coil penetrates the metal of the pan too. This fluctuating magnetic field now causes an electric current to flow through the material of the pan too. The current ‘induced’ on the surface of the pan in this way is called an eddy current, which is different from the electric current flowing through wires. Eddy currents (also known as Foucault currents) are actually loops of electric current that are induced in a metallic field due to a changing magnetic field nearby. This induced current travels around the metallic structure of the pan, dissipating some of its energy in the form of heat. This is the heat that raises the temperature of the pan placed on the cooktop and cooks the food inside the pan by heat transfer through conduction and convection. Here’s an interesting thing to note: if you switch on the power of an induction cooktop and place your hand on top of it, you won’t feel any heat! It would be at the same temperature as any other object in the kitchen. This is because, in order to produce heat, it needs a suitable pan through which a changing magnetic field can induce a current, which could then dissipate energy to produce heat. Before trying this little experiment, pay special attention to this important suggestion. This is VERY important, as the cooktop might still be hot from the heat of the cooking pan that had been placed on top of it a few minutes ago. Induction cooktops are very energy-efficient, in that they transfer most of the energy to the cooking pan with minimal loss of energy, which is a great quality to have in any electric appliance. Also, induction cooktops heat stuff up very quickly, unlike regular stoves, which lose a great deal of energy to their surroundings. They are also pretty easy to clean and operate and safe to use, thanks to the absence of any open flames, unlike regular stoves. A major drawback of induction cooktops is that they only work with pans and pots that are ‘compatible’ with them. The containers and vessels placed on the cooktop should contain iron in some form (e.g., stainless steel), as it’s the only metal that efficiently produces eddy currents and generates heat through magnetic fields. (Source). 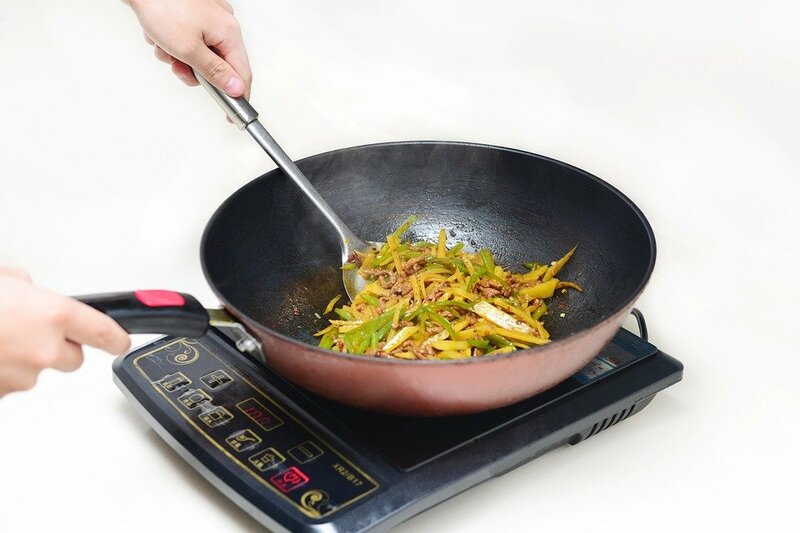 Therefore, glass, aluminium and copper cookware cannot be used on induction cooktops. In a nutshell, using an induction cooktop is a smart thing to do if you care about electrical efficiency, speedy heating, better cooking control and higher levels of safety. As for the suitability of your existing cookware for induction cooktops, just try sticking a magnet to them. If it sticks, then the pan/pot is fit to be used! Bon appetit!